Two high-quality USB Audio ADCs for audio capture. A while ago I tested some fairly basic USB audio capture devices which should give better results than the sound hardware in most general-purpose computer systems. The initial devices I tried were all aimed at users who want an inexpensive device, powered via their USB connection. In those comparisons the Focusrite Scarlett 2i2 came out as the design I preferred. So of you want make decent audio recordings using something like a laptop and a small USB add-on, the 2i2 is worth considering. Having examined those devices, my interest turned to considering alternative USB ADCs that could deliver much high audio quality. However going for higher quality has some implications. Firstly, the obvious: being prepared to pay a higher price for better components and a more carefully implemented design. 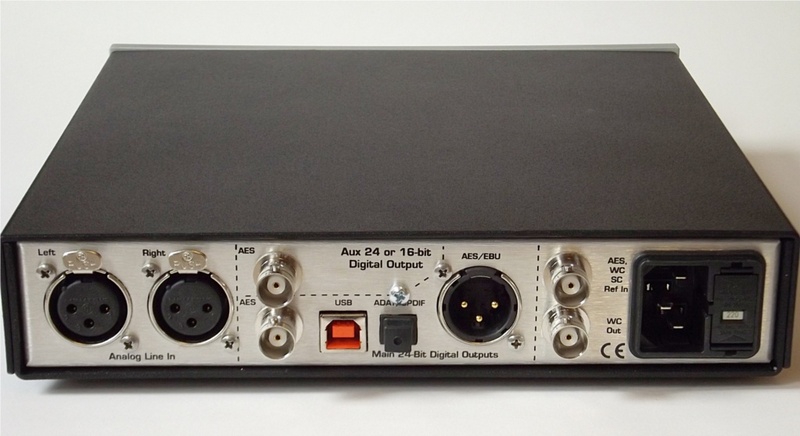 Secondly, the need for an inbuilt high-quality power supply to free the ADC (Analogue to Digital Convertor) from the limitations and problems inflicted by relying on power from a USB connection. And to accept that the device would be an ADC without an accompanying DAC. The less expensive units all provided a DAC along with the ADC. This is convenient for general home computer users. but means that some of the price is spent on the DAC. However most audiophiles – and users in professional studios – will already have a separate high-quality DAC. So money spend on another one, bundled with an ADC may be wasted. Hence at the highest performance levels it makes sense to buy an ADC where all the money has gone on the functions you require. I’ll start my detailed examination with the Benchmark ADC1 USB. This is clearly primarily aimed at professional studio users. It is a standard height designed to fit neatly into the common ‘19 inch’ rack-unit cabinets found in many studio control rooms. There are a set of front panel controls that allow you to accurately and repeatably adjust the input sensitivity over a wide range. It also offers ‘calibrated’ sensitivity which is set using small screwdriver, and is almost impossible to alter by accident in normal use. The ADC1 is clearly meant to be used in a professional situation where it can be setup and relied upon to work flawlessly and dependably day-by-day. It also has a useful set of front panel signal level indicators with an option to peak-hold, so it becomes impossible to clip a recording without noticing! The ADC1 actually offers three different digital outputs. Each of these can be independently set to provide different sample rates and sizes if the user wishes! This allows you do things like make a 192k/24 reference recording via one output, a ‘safety copy’ at 44.1k/16 to CDR via another, and feed a DAW (Digital Audio Workstation) 96k/24 via USB, all simultaneously! It also has a number of clocking and other options to aid use in a studio. Very flexible. Among the early checks I did, I used an IQ-test to examine the clock stability. This showed the clock was sufficiently stable that my measurements gave values of the order of 1 part per million which are the noise floor of my measurement process! So I can only say that the sampling clock is very stable indeed. Probably better than the equipment I used to do the test! The above shows the spectra I obtained from recording a 2kHz test tone using the ADC1 (shown in blue). For comparison I’ve also shown the results when using the Scarlett 2i2 (in red). 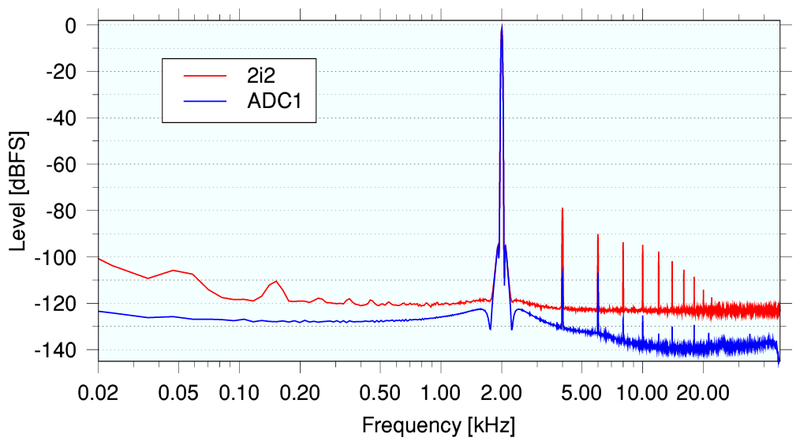 The comparison clearly shows that the ADC1 adds much lower levels of noise, distortion, and hum. The performance of the ADC1 is excellent. The noise level and clock stability is good enough to show the limitations of the FFTs, etc, I used to obtain the results. Each time I tested the ADC1 I was left with the feeling that I was mainly seeing the limits of the test equipment and processes I was using, and that the ADC1 was sailing though effortlessly. In use, I found the combination of the level controls and indicators made it easy to carefully optimise recordings. I’ve now made a number of 96k/24 recordings using the ADC1 and I’m impressed by the quality of the results. So if you’re looking for a high quality 96k/24 USB ADC then I’d recommend that the ADC1 is a unit to consider very seriously. As with most studio or professional equipment its inputs are balanced XLRs accepting ‘line levels’. So for recording from LPs you will need your existing or preferred RIAA pre-amp. And if like myself your hifi uses unbalanced RCA connections you’ll need an adaptor. But given these the ADC1 works superbly. P.S. 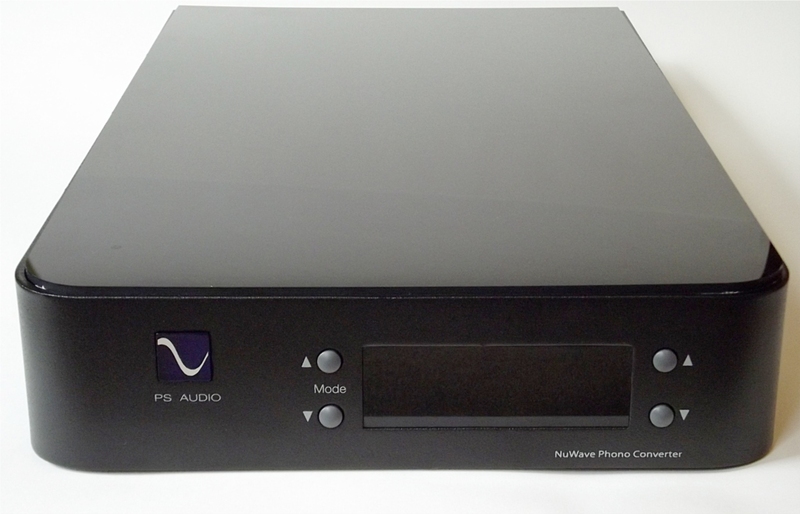 Audio NuWave Phono Convertor. The NuWave Phono Convertor (I’ll call it NPC from now on) is clearly aimed at a very different target user. It differs from the ADC1 in a number of significant respects. Unlike the ADC1, the NPC adopts USB Audio Class 2. This isn’t a problem for Mac/Linux/RISC OS, but it means that Windows users will need to install a driver. (sigh!) However it worked fine via USB with my Linux and RISC OS machines so I’m confident it also does so with Macs and Windows boxes. Being Class 2, the NPC provides higher transfer rates than the ADC1. So it can provide 192k/24 capture. Indeed, it will actually also output at sample rates of 352.8k and 384k! In addition to LPCM, it will also output DSD format! Although there are some qualifications on this I’ll get to later on. And NuWave themselves recommend that when using the NPC to capture LPCM you choose 96k/24 not a higher rate. The NPC also includes its own analogue RIAA preamp. It is clearly aimed at audiophiles who want a good RIAA preamp that can also make digital captures from their LPs either in LPCM or DSD format. For this reason its inputs are via conventional (for the home) unbalanced RCA connections, not XLRs. 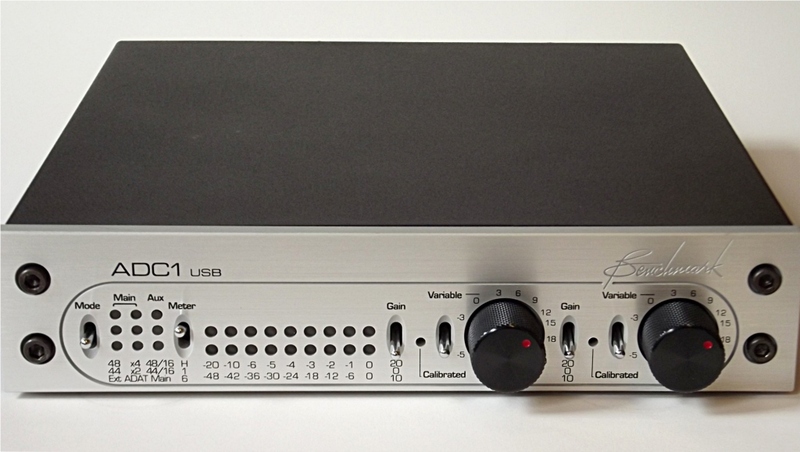 It does also provide ‘line level’ analogue inputs and you can make digital recordings from these over the USB connection. But the emphasis is clearly on the RIAA. This is clear because although the NPC has an extensive set of settings and adjustments for its RIAA input sensitivity and cartridge loading, the ‘analogue’ (line level) input has no gain adjustment at all. For the sake of comparisons here I focussed on the NPC’s line level inputs and making LPCM recordings. This made it easier for me to assess how it compared with the ADC1 for someone who is happy with their own RIAA preamp and LPCM. The above illustration shows the results of using the NPC to record a 2kHz test tone at 96k/24 via its ‘analogue’ (i.e. not RIAA) inputs. I’ve also included the ADC1 results again for comparison. Overall, you can see that the ADC1 gives a technically better performance in this situation. However the NPC has features and strengths that may mean you would prefer it in practice. In particular, if you prefer DSD to LPCM and want a combined RIAA preamp and ADC, then the NPC has the features you want, and the ADC1 lacks. The NPC gives various front-panel options. One of these lets you switch it between outputting LPCM samples and delivering DSD using the ‘DoP’ (DSD over PCM) protocol. So far as the USB system is concerned, this pretends to be LPCM. So should be handled by the USB system as if it were conventional audio. However each nominal 24bit ‘LPCM sample’ now conveys an 8-bit ‘label’ along with 16 successive DSD 1-bit samples. For stereo, these labelled packets of 24bits will alternate left/right as with LPCM. The label values help a DoP/DSD decoder to recognise that the data is DoP/DSD and then correctly convert the content back into analogue output. Two DSD options are offered by the NPC. DSD Standard rate. This is equivalent to the DSD format provided on SACDs. It is transferred over USB packaged as if it were 176.4k 24bit LPCM stereo. DSD Double rate. This is also DSD but using twice the 1-bit sample rate. It is therefore transferred as if it were 352.8k 24bit LPCM stereo. All this means that if your computer can capture LPCM samples at these rates from the NuWave then it should also be able to capture DoP/DSD when the NPC is set to send this format. The result should then actually be DoP/DSD provided your computer system doesn’t tamper with the data values because it blindly assumes it is LPCM. In effect you’re fooling your computer system into not noticing the data isn’t actually ‘normal’ LPCM! The trick gets around the lack of a specific agreed USB Class standard for DSD. But to use the result you do need to ensure your computer doesn’t try to ‘improve’ the data being captured. And you also then need audio software that can recognise and play DoP/DSD. Personally, I’m not really a fan of DSD, so this doesn’t attract me. But if you prefer DSD to LPCM it represents a major advantage of the NPC over the ADC1. In effect, you can make double or single rate DSD recordings of your LPs as you play them. You can nominally make up to 384k rate LPCM captures using the NPC. However P.S Audio do caution that these high rates aren’t recommended for LPCM. They are essentially a side-effect of providing high rates for DoP/DSD transfers. In practice the useable bandwidth is covered by 96k/24 LPCM so they suggest this as the maximum for LPCM use. The higher LPCM rates essentially just add high-frequency noise to the LPCM, and DSD is recommended over their use. Overall, there isn’t a clear universal ‘winner’ when comparing the NuWave Phono Convertor with the Benchmark ADC1 USB. The best choice would be the one that has the features you prefer. Personally, I like the ADC1 best. Indeed, I ended up buying the one I’d tested as it works so well! However I admit I do wish it had adopted Class 2 and been able to output 192k/24 over USB. If nothing else I’d have found that useful for test and measurement purposes! But I don’t miss 192k/24 for home audio recording purposes. And of course 192k/24 is available from its non-USB output. But its a shame it can’t provide this via USB. I can understand, though, why Benchmark have been reluctant to lumber Windows users with the problems of having to install audio ‘drivers’ on their stable studio systems when other platforms stopped needing this kind of nonsense ages ago! It just emphasises how other operating systems lead the way to better performance. Stereo LPCM Samples at the usual standard rates up to and including 96k. Provides 24 bit samples using 3 bytes per transferred value. using an ALSA specification like “hw:B20”. to record into a ‘wave’ file called ‘outputfile.wav’. This will have the standard Wave header as if it was a stereo LPCM file with a sample rate of 176.4k and a sample size of 32 bits per sample. However the actual ‘samples’ will be 24bit DoP format with a padding least-significant zero byte. The operating system won’t know this file isn’t LPCM. But a playing program that recognises DoP should be able to detect the flag values in the top-byte of each ‘sample’.